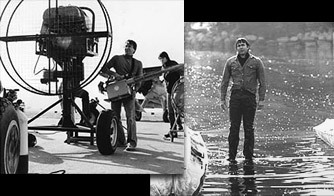 In 1969 Thomas FX's founder, John Thomas, established himself as Canada's first freelance special effects technician. In 1973 he established our company as Thomas Special Effects, and the Canadian special effects industry was born. From 1973 until 1994, hundreds of FX Technicians were trained under John's mentorship, and many who graduated from the company have gone on to claim their place amongst the top special effects technicians in the industry. While John Thomas passed away in 1994, Betty Thomas continues to head the firm that she and John built together as President & Board Chair. Underpinned by relationships that date back more than 30 years, Betty Thomas often refers qualified technicians to film and television projects as part of her commitment to provide exemplary customer service, and the company's ongoing commitment to serve the industry that John and Betty helped to build together. Today, the Thomas FX Group continues to be recognized as a premier supplier of special effects production supplies, custom breakaway glass, snow products, pyrotechnics, equipment rentals, and constantly develops new products for use by the industry, and by all who create unique special effects.